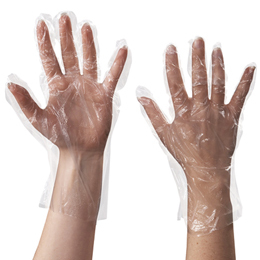 Disposable, clear, polyethylene gloves provide economical, light-duty protection. Polyethylene gloves are compliant with FDA requirements and are ideal for food preperation to prevent contamination. Poly gloves are latex free and come in an embossed finish.